As the nearest known AGB star (d = 64 pc) and one of the brightest (mK ≈ −2), L2 Pup is a particularly interesting benchmark object to monitor the final stages of stellar evolution. 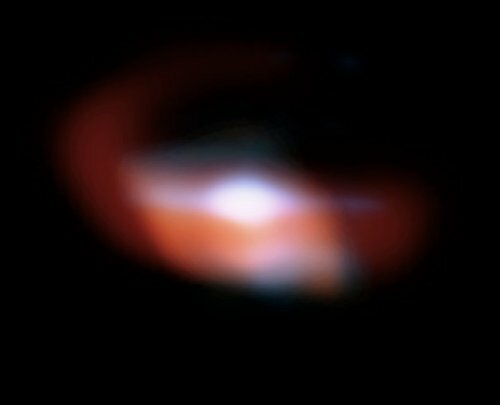 We report new serendipitous imaging observations of this star with the VLT/NACO adaptive optics system in twelve narrow-band filters covering the 1.0−4.0 μm wavelength range. These diffraction-limited images reveal an extended circumstellar dust lane in front of the star that exhibits a high opacity in the J band and becomes translucent in the H and K bands. In the L band, extended thermal emission from the dust is detected. We reproduced these observations using Monte Carlo radiative transfer modeling of a dust disk with the RADMC-3D code. We also present new interferometric observations with the VLTI/VINCI and MIDI instruments. We measured in the K band an upper limit to the limb-darkened angular diameter of θLD = 17.9 ± 1.6 mas, converting to a maximum linear radius of R = 123 ± 14 R⊙. Considering the geometry of the extended K band emission in the NACO images, this upper limit is probably close to the actual angular diameter of the star. The position of L2 Pup in the Hertzsprung-Russell diagram indicates that this star has a mass of about 2 M⊙ and is probably experiencing an early stage of the asymptotic giant branch. We did not detect any stellar companion of L2 Pup in our adaptive optics and interferometric observations, and we attribute its apparent astrometric wobble in the Hipparcos data to variable lighting effects on its circumstellar material. However, we do not exclude the presence of a binary companion, because the large loop structure extending to more than 10 AU to the northeast of the disk in our L-band images may be the result of interaction between the stellar wind of L2 Pup and a hidden secondary object. The geometric configuration that we propose, with a large dust disk seen almost edge-on, appears particularly favorable to test and develop our understanding of the formation of bipolar nebulae.